The Antique Series by Acri-tec. This foot claw-foot tub is constructed of High Gloss Acrylic and re-enforced with fibreglass for added strength and durability. Both the interior and exterior of the tub are formed from acrylic to make them easy to clean and provide a modern finished look. No additional painting or finishing is required to the outside of the tub. All Acri-tec claw-foot tubs are available pre-assembled with cast legs that are pre-levelled to make installation quick and easy. Available by special order only see store for details. Petite 4.5 ft. Cast Iron Clawfoot Bathtub in White and Faucet Combo in Chrome This 54 inch cast iron bathtub is perfect for those who want to place a tub in a smaller space and still enjoy all the benefits cast iron has to offer. The classical roll top tub adds a vintage touch to your home bathroom. With timeless styling and ornate tub feet, this tub will provide warmth and durability because of its cast iron construction. Combo set includes tub, faucet, drain and supply lines. Petite 4.5 ft. 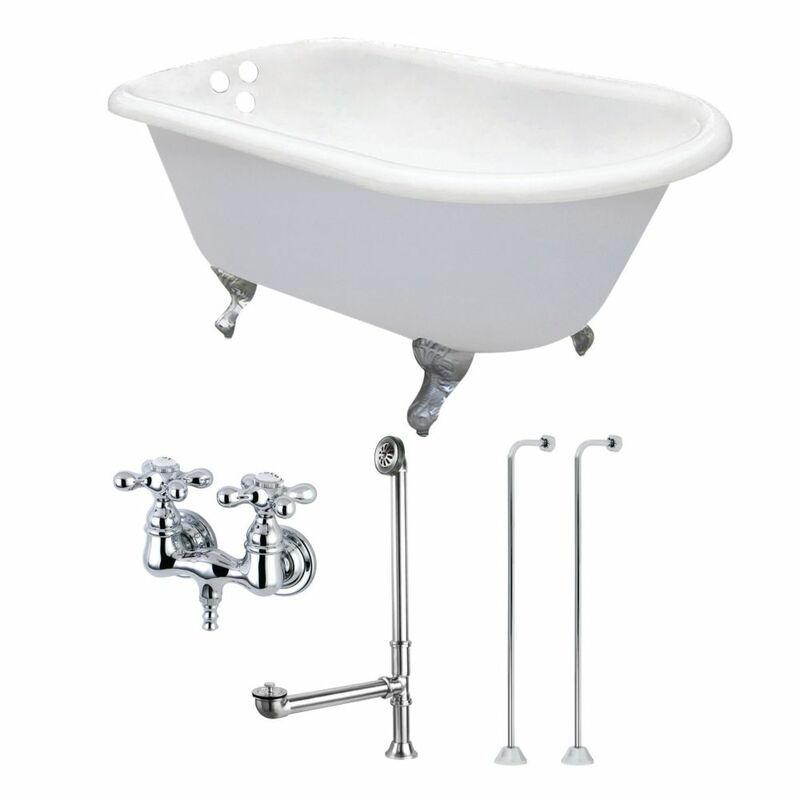 Cast Iron Clawfoot Bathtub in White and Faucet Combo in Chrome is rated 3.0 out of 5 by 2. Rated 1 out of 5 by Marsha from This is a gorgeous addition to our bathroom renovation. ... This is a gorgeous addition to our bathroom renovation. Plumbing was a little tricky but my talented crew got is right. I would definitely recommend this bathtub and can't wait to soak in it. Rated 5 out of 5 by Ellen from Absolutely adorable tub. Seems to be made of good quality.... Absolutely adorable tub. Seems to be made of good quality. All the fixtures are great quality. In spite of its size, it's still very heavy.